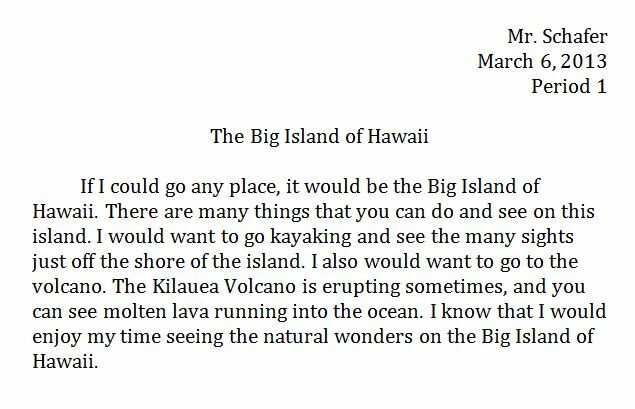 You are to produce a video about going to the Big Island of Hawaii. The script below is in Microsoft Word. There are six sentences in the paragraph. Show one sentence at a time in the video with pictures that match what is being explained in each sentence. Video #1 - Make a new folder that says Hawaii on your desktop and download the script and the sound file. Also, finds some pictures that will go well with the sentence in the script that can be used in the video. Video #2 - Add your pictures and the sound file into Movie Maker. Produce the video so the pictures match what is being said in the sound file. Video #3 - Put in transitions between each picture in the video. Video #4 - Put in captions so one sentence at a time is appearing on the screen. The sentence on the screen should match what is being said in the audio.